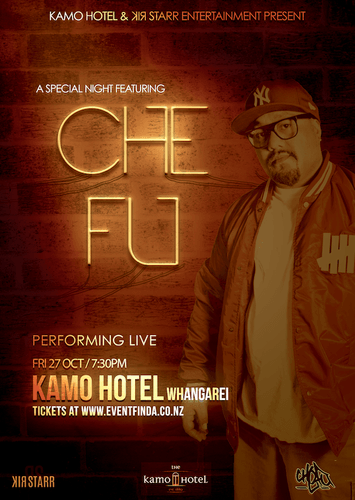 Kamo Hotel & Rikstarr entertainment presents - Che Fu. With the most Top 10 songs from any individual in New Zealand music history, Che-Fu is one of the country's most successful and beloved recording artists. Originally coming to attention as a founding member of the iconic Kiwi band 'Supergroove', Che went on to forge a solo career unrivaled in its success and the trail that it blazed not only for hip hop, but Kiwi music. Che writes and produces all his own music as well as writing the treatments and directing for all his music videos. Che is also an established club DJ having had a number of residence throughout NZ which earned him the right to judge at NZ DMC's and ITF's DJ competitions. Che has undertaken a number of marketing campaigns over the years including the following: Saatchi & Saatchi, Telecom, All Blacks, Bartercard, Vodafone, Ford, 'Pick it Up', Fizz. - Eight-time Recipient of New Zealand's Prestigious Tui Award. - Single of the Year (1997 Chainz, 1999 Scene III, 2002 Fade Away, 2003 Misty Frequencies). - Album of the Year (2002 Navigator). - Video of the Year (2002 Fade Away, 2003 Misty Frequencies). - Best Male Vocalist (1997, 2002, 2003). - People's Choice Award (2002). - NZ Order of Merit (2009 For Services to Music). Tickets available online or hard copy tickets purchasable from Kamo Hotel.